As I look back on this past season for BU men’s hockey, there are certain names that stand out among the rest for a variety of reasons. These picks were made by myself, Brady Gardner, and do not necessarily reflect the views of The Daily Free Press. Without further ado, here are my season superlatives for 2018-19. Even Hugo Blixt himself would have to admit the first-year defenseman looked like a deer in headlights at times to begin his debut season at BU. However, as the Sweden native adjusted to the pace and style of college hockey, he became an integral part of the BU blueline corps, logging important minutes in special teams play late in the campaign. 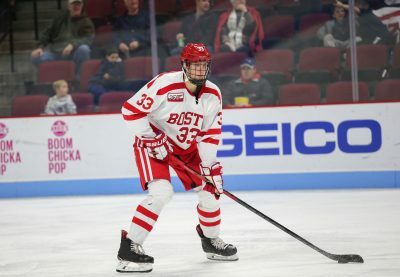 With BU’s two top defensemen moving on to the pros, Blixt will certainly be relied on more heavily in 2019-20. Becoming an upperclassman among a relatively young team, Patrick Curry took full advantage of his increased ice time with a break-out year and sparked a Terrier squad with admittedly few bright spots in attack. After tallying a combined seven goals and 21 points between his freshman and sophomore seasons, the Illinois native beat both totals with 13 goals and 26 points in his junior year alone. While BU has seen multiple offensive weapons depart in recent weeks, Terrier fans can be confident Curry will be a consistent top forward in his fourth year with BU. Likely overshadowed by talented defensemen above him on the line sheet, Cam Crotty deserves some credit as a solid member of the Terrier defense in all 38 games throughout the season. The sophomore put up five goals after just one in his first year on Commonwealth Avenue and finished tied for second in rating on the team with a +2 rating. Crotty was also third for blocks, with 68. There will be holes to fill on the BU blueline in the fall, but it appears Crotty is ready to take on a bigger role. It doesn’t take a hockey expert to notice Patrick Harper didn’t have the season he was hoping for in 2018-19. Despite appearing in every game for BU this season, the junior posted his lowest goal total, six, and second-lowest assists total, 14, in his three-year collegiate career. Whether or not the Connecticut native was still suffering from the after effects of the illness that kept him off the ice for 20 games to close out 2017-18, the Terriers will need Harper to show up early and often next season. Jake Wise was a heralded talent upon joining the team in the fall and excited Terrier fans with encouraging performances early on. However, a season-ending injury brought an abrupt end to the Chicago Blackhawks prospect’s promising freshman campaign after just 12 games. Heading into 2019-20, it will be interesting to see if Wise can become the player the BU faithful were optimistic he could be when he arrived at BU. You would struggle to find a team who relied on a single goaltender as much as BU relied on Jake Oettinger these last three years. The junior appeared in all but two games for the Terriers in 2018-19 and was asked on a near-nightly basis to mask inconsistent team defense with flawless play between the pipes. Oettinger did it all throughout his Terrier career. He maintained a high level of play season-to-season with 13 career shutouts and tied for the most in BU history, and came up big in big games with 89 saves on 93 shots at TD Garden in 2019. With the BU net now left to freshman Vinnie Purpura, a keeper who has made two collegiate starts, Oettinger represents a major loss for the Terriers as he moves on to the Dallas Stars farm system. This one is a no-brainer. Captain Bobo Carpenter was one of just two four-year Terrier skaters on the roster in 2018-19, but the North Reading resident more than pulled his weight in terms of leadership among a very young team. After Carpenter missed 10 games late in the season, there was a clear injection of energy and urgency when the senior returned to the lineup for the team’s playoff push. Carpenter demonstrated the highest level of toughness and dedication late in the season for BU and served as both a role model and source of inspiration when the Terriers needed it the most. You could not possibly put together a list of BU hockey superlatives from 2018-19 and not include Fabbro. The Canadian blueliner was a warrior for the Terriers as a junior, skating what easily seems like the most minutes on the ice for BU over the course of the season. The co-captain was involved on both ends of the ice, setting the pace for BU with 26 assists and leading all of Hockey East with 82 blocks. After concluding his time at BU as one of the team’s most reliable players over his three-year career, Nashville Predators fans have reason to feel good about Fabbro heading to their club after he signed an entry-level deal with the team. Fabbro gave Joel Farabee a run for his money with this title, but the freshman phenom edges out the co-captain solely based on his consistent production and immediate impact in his first season at BU. The Hockey East Rookie of the Year exploded for a team-leading 17 goals and 36 points in 2018-19 and was especially crucial in BU’s postseason run. Farabee tallied four goals in three games to lead BU over UMass Lowell in the conference quarterfinals. While Farabee would prove to follow the one-and-done path through college hockey, his presence was certainly felt on Commonwealth Avenue in the year he was with the Terriers.